hello nice reederz its dennis the vizsla dog hay even tho i agreed to kooperayt with the nice man frum mash and his frend wot is kind of skware and tasitern they stil lokd me up in prizzin!!! 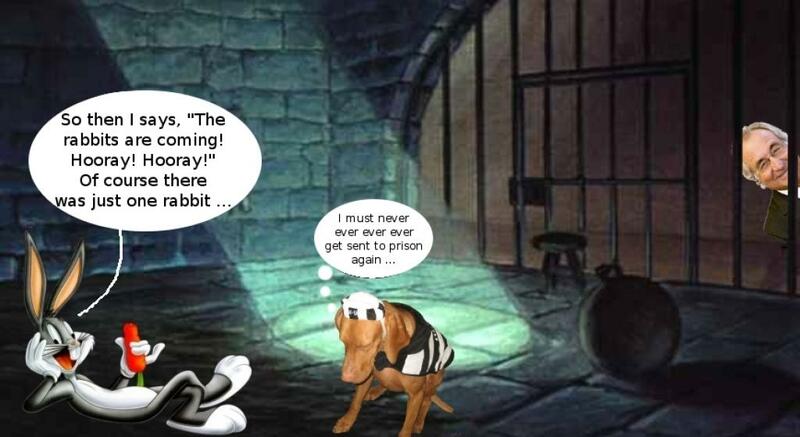 they say it is for my own protekshun but i am not shoor hoo they ar protekting me frum sinse the mini macgyvers ar all in jail too ennyway i dont like beeing in jail becuz yoo cant reely run verry mutch oh wel i hope i git a nice sellmayt this time and not that crazy rabbit agin!!! fortchoonatly i hav my cuzzin vinnie on retayner now and he wuz abel to spring me on bayl and hmm a fone call for me??? hoo cud it be??? yes its my frends from pointer pandemonium calling to let me no that i wun there nawty pup contest!!! i noo all my yeerz of trayning and effort wood pay off in the end!!! thank yoo so mutch pointers!!! lets go to the foto and viddyo montadj of sum of the hard wurk wot went into this prize!!! is it still a windo seet if its not in the windo? Oh Dennis! I think you would qualify as a Weapon of Mass Destruction! But a real nice one. Oh my gosh, you were so busted. At least you could have smiled at the camera… might have gotten you some sympathy. naughty pup yes, but totally adorable!!! 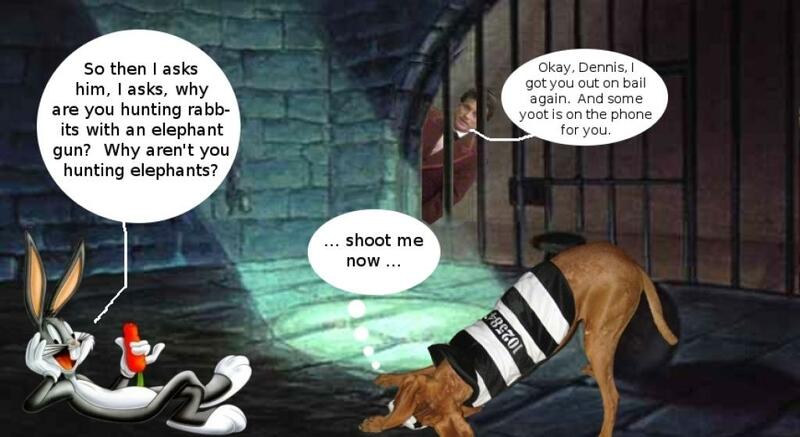 Look up “busted” in the dictionary, and there is a photo of Dennis! I really think it would have been another sign of the end being near had woo NOT been the winner! So Busted!!! I think this is what they call the terrible teens? I would like to see the video of when you came home and saw all of this.:+). Hi Dennis – well done on first place, wow, so well deserved, you worked so hard for it. We were astounded and humbled to get third prize – you’re now our inspiration. Tail wags – JD and Max. Uh Oh. Dennis, you let them film you???!!? I always worked in secret so they could never show the whole of blogdom what I was up to what I’m up to. I liked the element of surprise and watching their faces when they found my handiwork, too. I think I should say congrats. Maybe you’ll get a toy to shred….bwa..ha..ha..
Congratulations on winning the competition – as we said on Scott, Sophie and Hazel’s blog – you are the Master of Destruction! We are proud to be your friends. dang are you lucky dude, you get out of jail and then you get to win a contest?! is there a prize? perhaps a new window seat, not that you’d need one. I love that satisfying ripping sound in the video. Is your house bugged with hidden spy cameras? I think you were just looking for listening devices. Call Louie, Gus, and Callie. They will take care of that sheep for you. You mean to say you didn’t KNOW yesterday when I wrote that you won the Bad Dog Contest?? 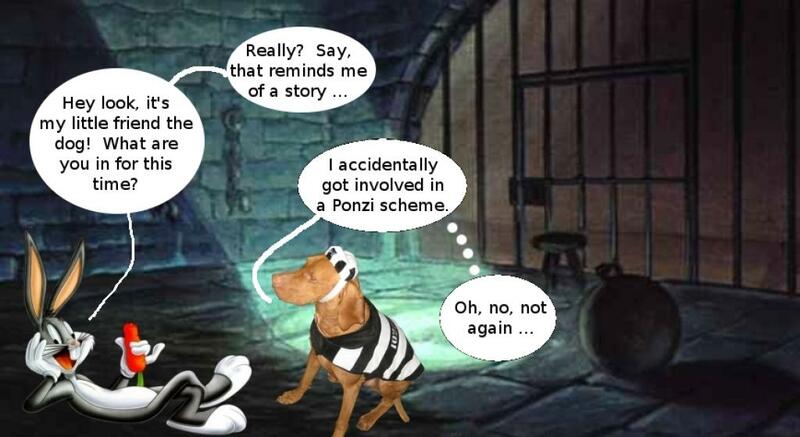 Maybe too busy being hauled off to the slammer to read your mail. Congratulations Dennis! Very well deserved! BTW I started another blog, please don’t hit me/bite me…. Thank you for your comment on our blog. Wow, I wish I had a chance to do something like what you did! Looks so exciting!! 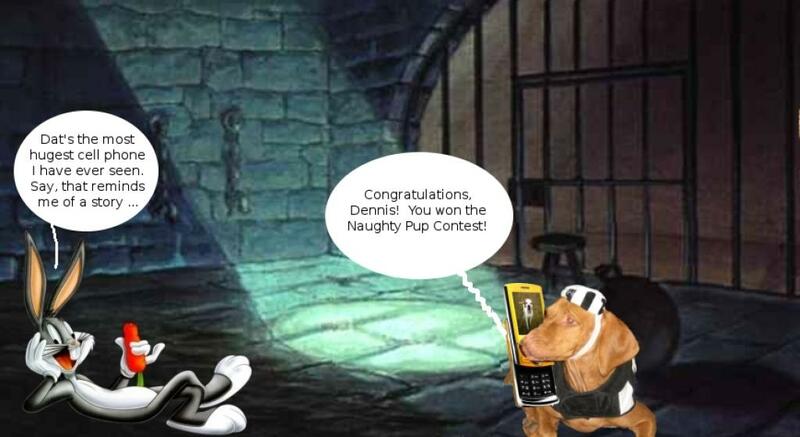 Congratulations on winning the Naughty Pup Contest! You surely deserve it. Glad your out of prison. Congrats on winning!! Hey Dennis nice job winning that contest!! I couldnt never do it cause I am a Very Good Dawg and I think that is prolly not the same as a Notty Pup. Well I mite have had a chance when I wuz in my prime. I could eat a windowsill or two when I wuz yunger.